Queen Bee's Garden Azle, Texas Full Service Florist & Garden Shop!! Our Delightful Bouquet is one that shines with stunning beauty and Spring freshness. 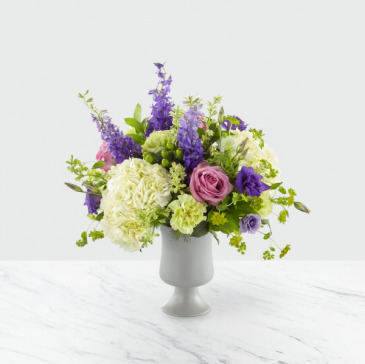 White hydrangea, lavender roses, and purple double lisianthus spill out of a matte gray ceramic vase. 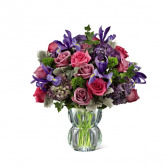 These charming florals are complemented by purple larkspur, green standard carnations and hypericum berries to create a stunning gift that will impress and dazzle its recipient. Capture your love this Valentine's Day with a gorgeous bouquet that is perfect for saying, "I adore every second with you," or "my life is better with you". 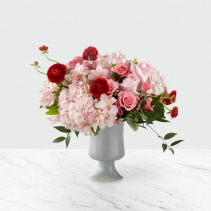 An array of pink hydrangea, pale pink roses, red ranunculus, and pink spray roses are set in a gray ceramic pedestal vase. With Italian ruscus and pale pink alstroemeria, our Swooning Bouquet is a gift that adds a touch of love to wherever it's place. 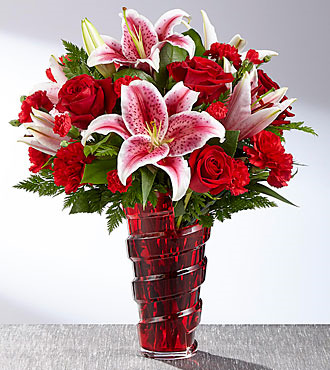 The FTD® Lasting Romance® Bouquet is ready to make your special someone's heart skip a beat this coming February 14th! Stunning Stargazer Lilies are set to catch the eye with their soft fragrance and fuchsia and white bi-colored petals, arranged amongst rich red roses, red carnations, and red mini carnations with lush green accents. 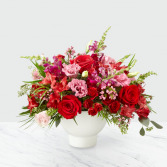 Presented in a keepsake red glass vase with a spiral design starting at the base and looping up to the top to give it a modern styling they will love, this gorgeous Valentine's Day flower bouquet is the perfect way to express your heart's every wish. The play of pink against green and white can't help to bring a mirthful beauty to this stunning bouquet. 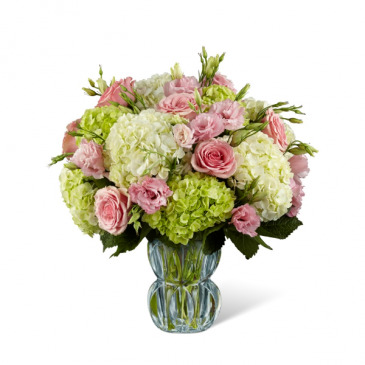 The blushing swirl of the roses and lisianthus bring a sweet drama to this arrangement offset by clusters of green and cream hydrangea. With the vase tinted in a subtle blue shade, to add even further interest, sparkling as it catches the light through each facet of it's unique design, this gorgeous flower arrangement is ready to set the stage for a treasured moment of pure happiness. The FTD® Only The Best Luxury Bouquet price $119 150 On Sale! Limited Time Offer! 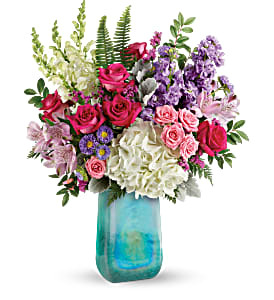 Delivery Location & Date Enter Location & Date Arranged & Delivered By Florist Add to cart When only the best will do, this fresh flower arrangement from FTD® delivers. 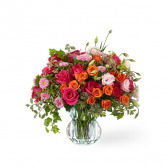 A collection of colors and textures that keeps the eye dancing from one point to the next, this artisan floral design blends hot pink roses with orange spray roses, pink double lisianthus, pink Veronica, pink matsumoto asters, and orange protea with the lush green foliage of ivy vines, variegated pittosporum, and trend forward succulents. 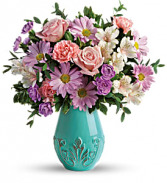 Presented in a light blue heavy glass vase with a sophisticated look, set to catch the light at every turn, this luxury flower arrangement is an impressive and thoughtful way to celebrate Mother's Day, a birthday, an anniversary, or to offer your gratitude and thanks. There’s something about simplicity that just gives off the sense elegance. Comprised of classic white blooms and luscious greens set in a subtle blue heavyweight glass vase, the pure beauty of the bouquet instantly draws you in. 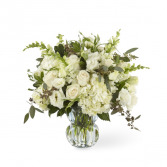 Vendela roses, snapdragons, and hydrangea capture a truly refined bouquet. 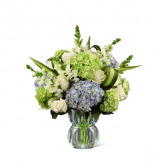 Clusters of blue and green hydrangea give this floral arrangement a fresh focus, drawing the eye with pops of white roses and snapdragons perfectly placed with an artist's eye to create an unforgettable moment upon delivery. Notice how the flax leaves are placed within the arrangement to give it all a sense of movement and grace, taking the design aesthetic to a new level of sophistication. The subtle light blue color of the vase helps to bring forth the blues and greens within the bouquet, making this both a warm and airy design that will help you send a gift that truly speaks from your heart. There is a certain sophistication this piece that is both artistic in design, but also has that garden gorgeous appeal that will draw your special recipient's attention. The colors in this design blend into each other throughout the bouquet, allowing the eyes to not only take in the full picture, but also move across it, as each bloom draws focus to this incredible floral gift. 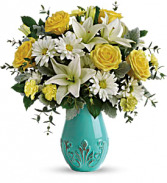 Presented in a light blue glass vase that helps to reflect the light up and around each flower, this bouquet is rich in design and style to help you send a gift that is truly unforgettable.